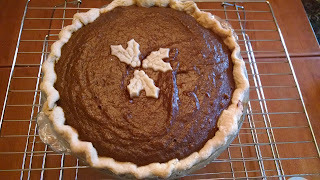 Today's projects were to make a couple of pies (for tomorrow) and prepare our Christmas Eve feast. I'd made the pie crust and roasted the sweet potatoes for a chocolate sweet potato pie already so all I had to do was roll out the crust and mix up the filling. I got out of work early today and that allowed me time to get the pies done before the ducks had to go into the oven. The ducks are becoming our own tradition, which is terrific. The traditional Christmas dinner at my parents was always beef tenderloin and baked stuffed shrimp. Instead we have gravitated to duck which my husband always roasts to perfection. 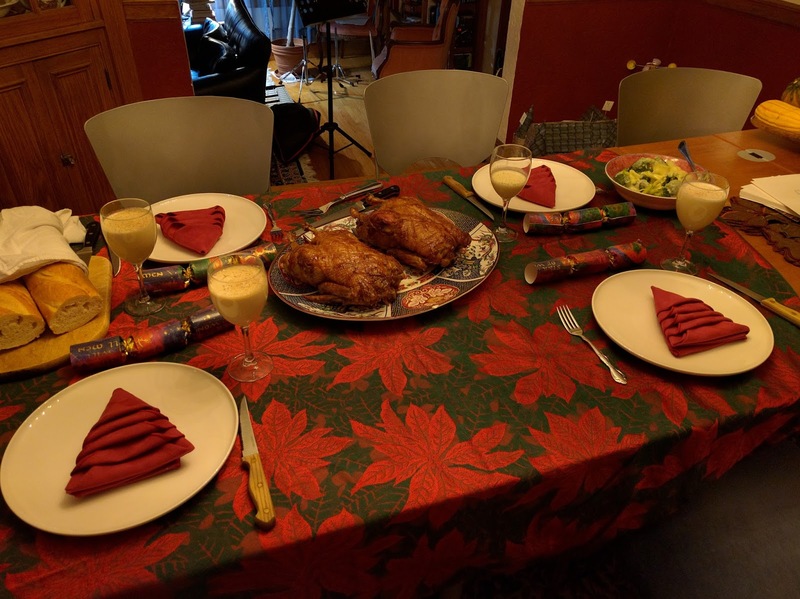 This year he roasted 2 ducks, enough food for the four of us and some meat set aside for soup. The bones will be made into stock, the livers into paté, and I have almost 4 pints of rendered duck fat for cooking. When we stopped by the grocery store this evening they were out of eggnog. This was a calamity! Fortunately, I found this recipe for eggnog which was really terrific. I only made half the recipe and the other changes were that I used half and half instead of light cream and we used cognac instead of rum. The elderchild artfully folded the napkins for our Christmas table. None of us wanted to unfold them, they were so nicely done. After our lovely dinner, we ate ice cream (eggnog and peppermint-hydrox flavors) and watched The Year Without a Santa Claus. Tomorrow, the presents!